Splitting firewood is a necessity that dates back to the beginning of time. Beginning with chiseled stone wedges, evolving to wedges and mallets, and then came the invention of the maul or ax used for centuries. However, now we've got newer innovations in log splitting technology. If you're not interested in making the leap to a gas or electric log splitter, but would like to save your back from the exhaustion of heaving an ax to split up fuel for your fire, we've got a great option for you. The manual log splitter makes it easier to split wood by taking the old hammer and wedge technique and incorporating it into a single tool that features a wedge and weighted striker in one. If you're looking for the easiest way to split firewood, we suggest exploring our Log Splitter Buyer's Guide. However, if you're interested in keeping it simple or need something small and gasless for splitting kindling inside your home, this may be what you're looking for. When Might You Want Something More? Frankly, we're not the biggest fans of manual log splitters. We recommend getting an electric log splitter instead if you've got any serious amount of firewood to split. While these splitters are effective for splitting firewood into kindling, they make for a long hard day when you're splitting large logs into quarters for aging. 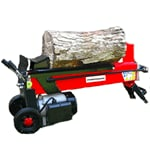 With an electric log splitter, you still use a wedge with force to split the wood. However, instead of lifting and heaving a weight down on the wedge, an electric motor replaces your muscle power so you can save your stamina for more important things. And with electric log splitters, there are no fumes, so you can still use them inside if necessary. Depending on your workload, this may or may not be the ideal tool for you. Consider the amount of wood you'll be splitting, and also the size and density of the wood you'll be splitting. 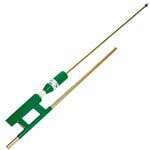 Then decide whether a manual log splitter will be fully sufficient or more of an accessory. Manual Log Splitter Buying Guide - Find Out How to Pick the Perfect Manual Wood Splitter. Our log splitter how-to library can help you pick the perfect electric log splitter, gas log splitter, 3-point hitch log splitter, skid steer log splitter or log splitter accessory.